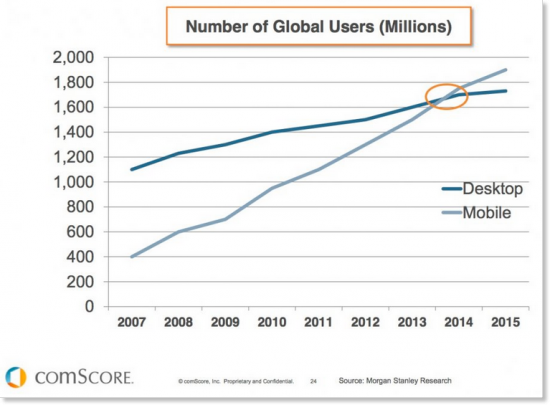 BlogHome » How important is mobile traffic? Earlier this year google created an algorithm which looks at whether your website is friendly for mobile and tablet users. If you are not “mobile friendly” your rankings from a mobile device will drop, therefore, you will get less traffic. But how important is mobile traffic? Mobile marketing is now a hugely important party of any digital marketing strategy, with the global number of internet users using their mobile devices more than desktop computers. This means that your company’s website is potentially accessible from anywhere at any time. Now Google is ranking sites that are mobile friendly above non-mobile friendly sites. So if you don’t have a good mobile site you will be losing your rankings, therefore losing business from the device most used to browse the internet! Now do you think mobile traffic is important? According to research conducted by Centre for Retail Research (CRR), the UK retail industry is losing £6.6bn per year due to lack of investment into mobile sites. Retailers have reported that their sales from mobile devices have almost doubled between 2013 – 2014 and more in 2015, so now in 2016 we would assume this would increase further. As we are seeing more people use their mobile for internet browsing, Google has stepped up their game and introduced an algorithm which looks at the usability of a website from a mobile device. 1. Can I read the text on my site from a mobile device? 2. Can a user click on links and the menu’s to navigate around my site? 3. Does the page fit with ways (without scrolling)? If you answer no to any of these questions then you could be missing out on traffic, opportunities and sales. previous post: Digital Marketing Trends to Expect in 2016! next post: Oh So Simple SEO – The Basics!